Pura Vida Retreat & Spa in Costa Rica’s Central Valley offers a variety of unique accommodations scattered across lush landscaped grounds, each nestled amidst verdant gardens with stunning panoramic views. Nightly rates include all meals. This eight-acre gated retreat center is surrounded by coffee draped hills just 20 minutes from Costa Rica’s Juan Santamaria International Airport (SJO). Pura Vida offers 48 nature-friendly rooms with lush garden or epic mountain views, ranging from luxurious suites with wrap-around porches to A-Frame Cottages and eco-chic Tentalows. Pura Vida is so beautiful and so peaceful! The entire staff are wonderful people and they are always ready with a smile to make your stay as comfortable as possible. The food is out of this world! I plan to go again soon! Everything about this place is purely magical. The grounds are impeccable featuring fruit, herbs, and flowers. The food is cooked with love and extremely delicious. The studios offer breathtaking views. The staff is so friendly and knowledgeable. It was a retreat of a lifetime! The Vibrate Higher Women’s Retreat is an immersion in purpose, inner power and self-care for women who are ready to let go of what’s holding us back and tap into what brings us MORE HAPPINESS, MORE LOVE, MORE CONFIDENCE, MORE SATISFACTION, AND MORE SUCCESS. Life coach and trainer, Amber Lee Forrester has designed a purpose-driven vacation for healing, growth, and transformation. Join her, spiritual teacher Shaheerah Stephens, global women’s empowerment group, The Colored Girl, and the healers of Pura Vida Retreat and Spa in Costa Rica, April 22-27th. Sound like just what you need? Book today! Email us at Hello@39quartz.com with questions. Are you dreaming of a mountain retreat or an oceanside escape? Massage Education Vacations are the way to go! Join for an adventure learning experience of a lifetime! Meet us in Costa Rica for an exceptional educational experience and an awesome adventure all in the same trip! We offer multiple adventure travel opportunities in Costa Rica several times a year. Do you want to go to the mountains? the beach? both? You can have it all! We’ll see you in paradise! 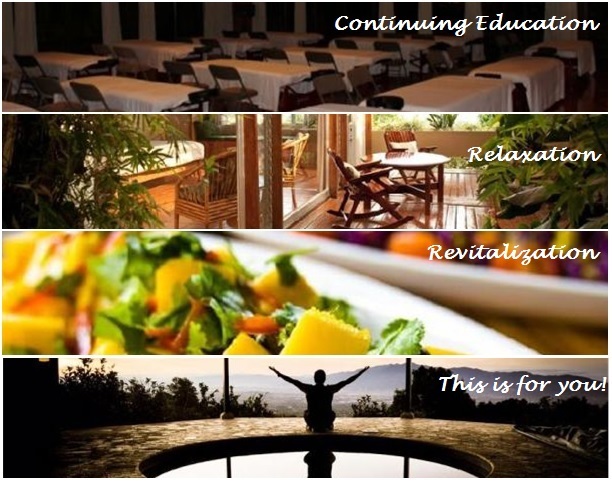 Our most popular seminar series is held at Pura Vida Spa in the spring and fall. Pura Vida is located in the mountains of Costa Rica near San Jose at a yoga retreat. We have been hosting this series with great student satisfaction for many, many years. Many of our Pura Vida alumni wanted to return to Costa Rica for additional adventures and different learning opportunities. Earn up to 40 CE hours at our mile high mountaintop retreat. Get certified in Medical Massage or Cranio Sacral Therapy (40 CE hours), Thai Massage or Aquatic Bodywork (30 CE hours). Meet massage therapists from all over this world who come to train in this peaceful paradise. All classes are approved by NCBMTB. Every massage therapist should take advantage of this great opportunity to learn some great skills and earn CE hours while on vacation in paradise! Save the date: We will also be offering this Adventure Learning opportunity at Pura Vida in Costa Rica September 8-15, 2018. Details will be provided shortly.